1. 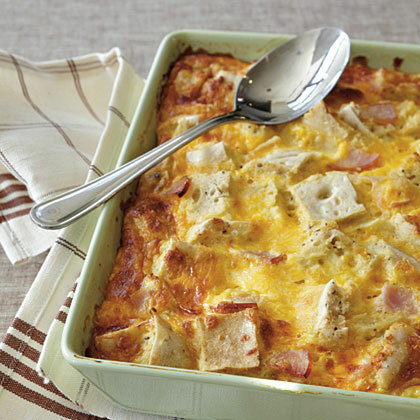 Combine muffin cubes and Canadian bacon in a 13 x 9–inch baking dish coated with cooking spray; sprinkle with cheese. 2. Beat eggs and egg whites with a mixer at medium speed until blended. Add milk and next 5 ingredients, beating at low speed until blended. Pour egg mixture over muffin mixture. Cover and chill at least 2 hours or overnight. 4. Remove casserole from refrigerator, and let stand while oven preheats. Uncover casserole, and bake at 350° for 45 to 50 minutes or until browned. Let stand 15 minutes before serving.